2011 was a year of change throughout the world. Many countries in the Middle East underwent political upheavals — the repercussions of which will surely unfold for years to come. The people and churches we serve in the region — from Iraq to Egypt to Syria — were undoubtedly affected. Through it all, and with your generosity, CNEWA has assisted Christians throughout the Middle East. This year has been one of change for our agency, too. In September, we welcomed a new president, Msgr. John E. Kozar. With your continued support, CNEWA will remain a lifeline to those in need in the Middle East, Northeast Africa, India and Eastern Europe in 2012! May your New Year be a blessed and prosperous one! 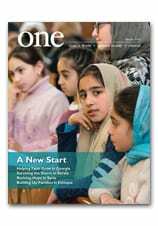 In the July issue of ONE, Peter Lemieux reported on the work of the Nirmala Dasi Sisters with Mumbai’s poor. Many of the people the sisters serve live in Dharavi, Mumbai’s most infamous slum. Today’s front page of The New York Times featured an article on Dharavi and it’s residents’ unwavering hope in spite of the many odds they face. For more, read In One Slum, Misery, Work, Politics and Hope. Founded by the Good Shepherd Sisters in 1987, the Bethlehem Day Care Center serves the families of Cherkos, an impoverished neighborhood in Addis Ababa, Ethiopia. A Catholic school education opens the door to a new world and better life for many of the families CNEWA serves. Its value is priceless, as Sean Sprague reported in this story from the March 2006 issue of ONE. While much progress is being made at relatively prosperous schools like Bisrate Gabriel (which CNEWA supported in the past), the greatest challenges lie with Ethiopia’s underserved poor. For more see, Making the Grade in Ethiopia and Breaking Barriers. To learn how you can help educate a child in Ethiopia, visit our website. In Ukraine, a boy stands before a tetrapod (icon stand) and a Nativity scene. We’ll be celebrating the holiday this weekend and returning to the office on Wednesday. In the meantime, from our family to yours: have a safe, blessed and happy Christmas! Throughout the Northern Hemisphere, today marks the winter solstice. It is the shortest day and the longest night of the year. The image above, from the November 2004 issue of ONE, shows carolers in Ukraine in the snow. What better way to weclome winter! But outside ways are making an impact on the Hutsuls; a dearth of job opportunities threatens the Hutsuls and their traditions. Still, even as they venture out into the world, the Hutsuls hang on to their traditions. On Christmas visits, Mrs. Havryliuk’s three grandchildren never fail to return to carol. For more from this story see, Faith and Tradition.